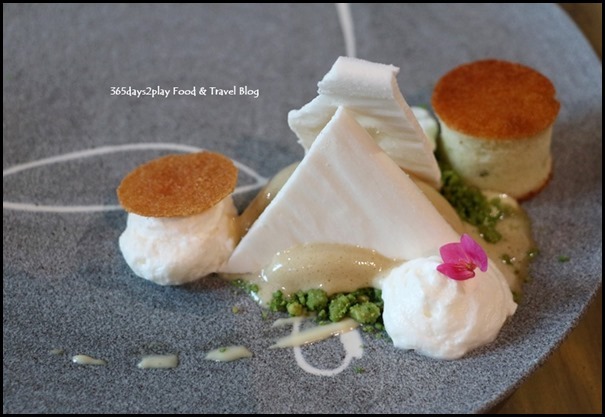 Janice Wong Restaurant at the National Museum–Exquisite plated desserts! Attended the Margaret River Gourmet Escape pre-launch event held last week at the newly opened Janice Wong Singapore. Before I delve into the details of the Margaret River Gourmet Escape (happening on 18 – 22 November 2016, tickets available here), here’s a quick sneak peek into the fantastical desserts that Janice Wong has conjured up at her second outlet in Singapore, which she will also feature at the festival. Btw, the restaurant at the National Museum sees Janice Wong expanding her culinary repertoire by introducing mains to the menu. Yes, the menu offers savoury items, although it seems limited to noodles and xiao long baos mainly. This dessert had me nearly scraping a hole into the plate to reach the last tasty drop. The pandan kaya and coconutty flavours were really pronounced, and it was a nice way to enjoy “kaya toast” in an icy cold manner.